Zombie fingers. That's how the TJ's employee described these to Sonia when she bought them. And he's not wrong, as you can clearly see from the picture below. Each banana is about the size of my pinky finger—on average, anyway. 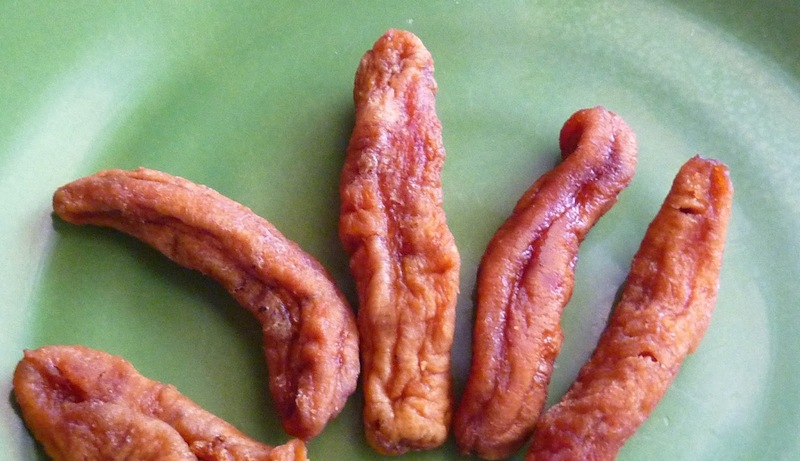 They're sweet, chewy, and they taste surprisingly like actual bananas. They have the sweetness and flavor of a dark, overripe specimen—you know, the banana that's been sitting on the counter too long—but without the nasty mush that comes with it. 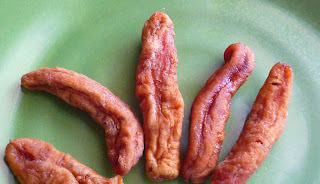 Texture-wise, they're very similar to other dried fruits, not crunchy like banana chips. They're fairly firm, and for lack of a better term, I'd say they're slightly "leathery," although not in a bad way. 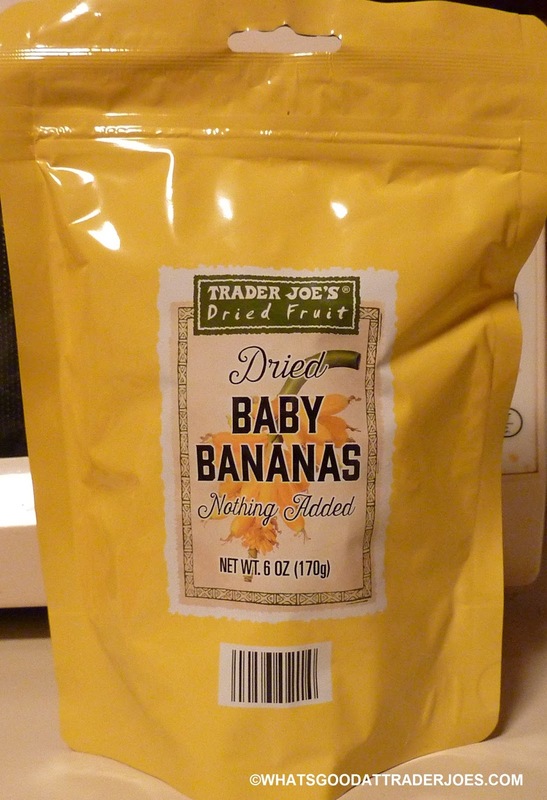 There's one ingredient: dried bananas. Amazing. I'm not sure if "baby bananas" are just young bananas or if they're a different strain of miniature banana altogether, but they're extraordinarily snackable in my opinion. I also can't tell if they just leave the peel on the banana or if they take it off. I would think they'd have to take it off, but then again, perhaps baby banana skins aren't particularly tough like grown-up banana peels. Furthermore, the drying process may counteract any toughness that one might encounter. 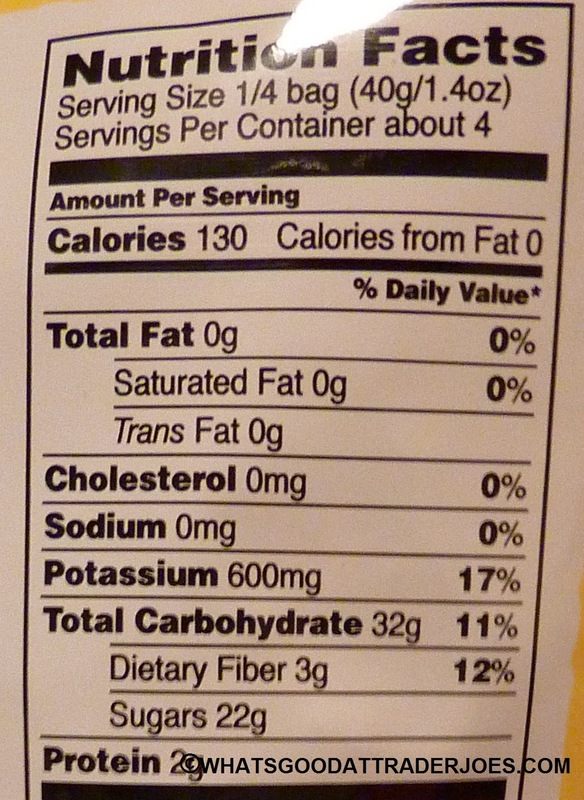 Health-wise, they're pretty much like big bananas. Any sugars present are completely natural. 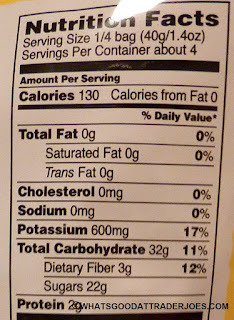 Plus, there's protein and lots of fiber and potassium. I've often felt like just a little bit of banana, but didn't want to commit to a whole big piece of fruit. My prayers have been answered. They come in a handy, resealable bag, too, so there's no pressure to eat the whole package. The convenience factor on these little, natural treats is very, very high. If you're into the taste of super-ripe bananas and like the texture of dried apricots, figs, or prunes, then these will be right up your alley. Perfect snack for a long hike or camping trip. Double fours on this one. They taste like banana bread!!! You always have great ideas, Alek! I want it so bad! I'd love a banana I can pack for lunch without worrying about it getting squished. Anti-squish bananas are finally here! Price? Just curious because regular bananas are so cheap! So excited these are back! They used to carry them several years ago and I always drew raised eyebrows when I would buy multiple bags. I find their texture/chew factor more enjoyable than the flattened banana slices. Hope they stick around this time. Interesting! Didn't realize these were around before. I just bought these today and am loving them right now. I purchased them this evening and dipped a couple into Nutella! Yum! These are soooooo good! I'm having a hard time not eating the whole bag in one sitting. Trader Joe's manager said they are seasonal. Do banana's have a season? I didn't think there is. I see babanas at costco all year round... Com'on they have dried strawberries all year long..I would think strawberries are seasonal fruit.